Experience this true "Governo Method" Chianti Classico Riserva which has reached a peak of maturity. Silky and complex. A rare Riserva with 10 years of age and drinking at a peak of perfection. 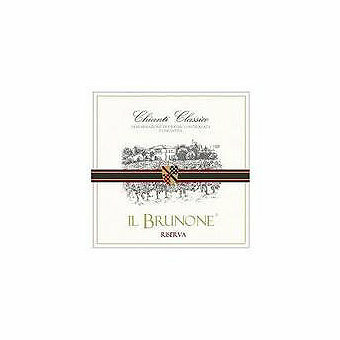 Produced only in the best vintages this Riserva is made from selected grapes in Il Brunones single vineyard which grows the mother clone, one of the oldest existing Sangiovese clones. Situated at 1000-1100 feet above the sea level and southerly facing, the vineyard encourages optimal maturation of the grapes. Fermentation is in stainless steel tanks at a controlled temperature for 12-18 days. After the alcoholic fermentation, the wine is placed in cement-vitrified tanks for the second fermentation known as the governo method. The technique involves saving a batch of harvested grape and allowing them to partially dry. The half dried grapes are added to the must which then gives the yeast cells a new source of sugar to enliven the batch and adding richness and complexity to the wine. The wine is aged 24-32 months in 20 and 15 hectoliter Slovenian oak casks and then extended bottle aging in the winery cellar. When it was released Wine Enthusiast Magazine scored this 90 points saying "Made with Sangiovese and 5% Canaiolo, this wine starts with aromas that recall plum cake, prune, dried cherries, vanilla and a hint of leather. The palate offers up juicy black cherry, black raspberry, white pepper and cake spices that are balanced with silky, smooth tannins. Soft, round and ready to enjoy, it will maintain well for another few years at least. Drink through 2022."